That’s the one reply I received when I asked about the Norinco Tokarev. With that sage wisdom I traded away my EAA Witness Polymer for a Tokarev pistol, holster, three magazines and 500 rounds ammunition. There are nearly as many variations of the Tokarev as people killed by communism. Mine comes with a frame mounted safety–or at least it should. When first looking at the gun I noticed a cutout in the grips for a safety lever, yet the lever itself was absent. Being the smart guy that I am, I figured that the grips were simply for another variant other than the gun they were currently on. Originally the Tokarev was designed without a safety. This is a throwback. Upon closer inspection at home I noticed detents in the frame for the safety, with the lever nowhere to be found. I immediately reached out to the previous owner asking if he had the safety, or if he new why it was missing. He gave no reply, and I’ve never heard from him again. Luckily, the gun functions perfectly without the lever. Since the Tokarev isn’t drop-safe I probably wouldn’t be carrying in Condition One anyway. Lesson for all you kiddos, do a close inspection of whatever it is you’re looking at buying before you close the deal. The Tokarev has a surprisingly nice, straight-pull, trigger. It’s not as crisp as as 1911, with a fair amount of slack, but my example has zero grit and not an ounce of stacking. Reset is incredibly short, besting even my Springfield Operator. Magazines hold eight rounds and drop free from the gun. The magazine release is a small, smooth button that requires enough force to keep from worrying about accidentally ejecting your magazine, but not so much to slow a reload. Sights are very tall, and typical of guns of the era, featuring a thin front blade and narrow rear notch. Despite the sub-par sight picture, I am able to out-shoot several pistols that have superior sights. 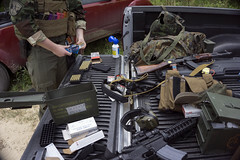 I have yet to have a malfunction of any sort in over 200 rounds Prvi Partisan 85gr JHP and FMJ ammo. Reliability is the same across a box of surplus FMJ. I’ve always heard how 7.62×25 was comparable to .357 magnum; that it’s a hand cannon. That couldn’t be farther from the truth. Even though PPU 85gr hollowpoints produce an astronomical fireball, the recoil was next to nothing. Surplus ammo is noticeably stouter when it comes to recoil, though with a smaller fireball, but nothing to write home about. The Tokarev is without a doubt the softest shooting centerfire handgun I’ve ever shot.